Take your promotions on the road with eye-catching pull up banners. We supply 850mm or 1200mm wide pull up banners on a selection of bases. There is economy for infrequent use (ie a permanent display) or regular/heavy duty use (for local or interstate promotions. The normal viewing hieght is 2000mm although other heights are available. 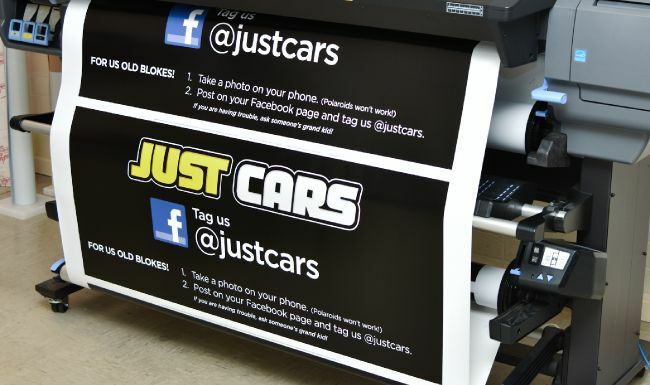 All our banners are printed with enviromentally friendly Latex inks on the latest non-curl materials. We offer 48 hour turnaround on your A3 Posters. Or for larger sizes we will print on an A1 offset press. We offer a full large format service. Posters or banners up to 1300 wide will be printed within 24hours on our HP 310 Latex printer. Coreflutes, A Frames, Pull Up Banners, Foamboards, Posters from small to huge, Plasnets, Flags, Clear Focus, Stickers, Stickers Cut to Shape, Banners (with or without eyelets) and MX Sticker Kits.See below for some examples.